Mr. George David Campbell, age 69, husband of Brenda M. Campbell of Chesnut Street, Corbin, Kentucky passed away on Sunday at the University of Kentucky Hospital in Lexington, Kentucky. He was the brother of Edward Allen Campbell of Pine Knot, Kentucky. He was also blessed with many special friends. 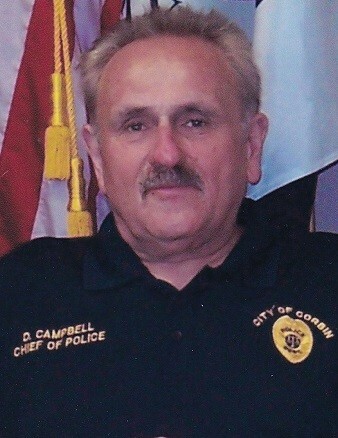 He was a retired Police Chief with the Corbin City Police Department and a retired Trooper with the Kentucky State Police. Funeral services for Mr. George David Campbell will be conducted at 7:00 p.m. on Friday evening in the Laurel Funeral Home chapel with Pastor Bobby Joe Eaton officiating. Kentucky State Police Honors will be provided by the Kentucky State Police Honor Guard. The family has requested that Graveside services be Private. The family of Mr. George David Campbell will receive friends at Laurel Funeral Home on Friday afternoon from 5:00 p.m. until the funeral hour of 7:00 p.m.
Obituary information courtesy of Pine Knot Funeral Home.